Comics Head is an excellent, all-inclusive comic-making app that is perfectly suited for ages 8 to even 18. Pupils today are well-versed in graphic novels, comic books and cartoons, and this app from Next Wave Multimedia offers a creative composing opportunity using these elements. With multiple layouts, tons of props, text options, customisation tools and sharing features this app can be used across the curriculum to design quirky informative comics or professional story boards. Asset Store – This enables the user to download thousands of new illustrations from the extensive library which includes Sci-Fi, more animal expressions, silhouette, food, props, symbols, more character expressions and textures. This feature is an excellent added bonus and is completely free. Be careful though because it can depend on your Wi-Fi connection for speed of downloads. Enhanced Filters – Choose from a variety of new filters with enhanced custom features. These include textures that create a subtle background behind or around the picture. Controls for Contrast, colour RGB separation and some great filters similar to those you would find in Photoshop these include halftone, sepia, glass, pixelate, vignette, posterize, invert, chrome, fade, instant, mono, noir, photo effect, tonal, transfer, maximise and minimise. We in particular liked the Dot feature within the Halftone filter to give your image that classic Lichtenstein comic book look. Import images from multiple sources – With the wide variety of editing and creative tools available the ability to import to the comic from other sources is a great feature. This can be done via Dropbox, Flickr, photos and Google Drive. We found this very useful when dealing with large files and images. 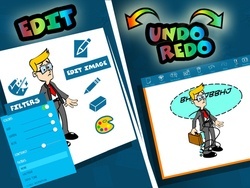 Undo & Redo functions – This added feature enables the user to Undo and Redo their designs. A great asset for those younger users and those just starting out. Edit More function – The app also introduces some new editing features to enhance your images. These include colours, crayons, line, shape, erasers tools. Hours of great fun! Facebook Messenger Share – You can now save and share instantly on Facebook Messenger along with other social media applications. This is a welcome addition to this ever popular social media tool. The app is beautifully presented with bright, vibrant colours, backgrounds and type, all you would expect from a comic style interface. The menus are clear and easy to navigate and provide endless options from the most basic to the most professional of comic layouts. The app starts off by providing a page layout where there are numerous options from a single page to multiple layouts. Once the layout has been selected it is then up to the user to create their comic using the menus at the top. If you are undecided about your layout and style you can use one of the 36 templates to get you started. This home page also provides links to YouTube tutorials, parental settings, help menus and social media. Previous comics designed are also shown here. The Content Box icon – this enables the user to create the main content of the comic including backgrounds, characters, props and special effects, themes, photos, web links and maps. We loved the extensive range the app had to offer and there are selections for most scenarios. The themes are excellent and they not only provide backgrounds but also suggestions for characters, props that may fit into your scene. The props and special effect menu provides traditional comic caption such as Bam, Ka-boom etc. Although the props are limited, the special effects are great fun. This menu also enables you to load photos from your device if you wish to incorporate them in your comic. There are links to social media photos here also as an option. Once a background, character, effect, photo is imported into the comic strip you can manipulate the image by reducing, enlarging, rotating with a pinch or dragging between panels. Double tapping on the image enables you to flip, duplicate, crop, filter, delete and make transparent. We found this tricky at first and it takes some getting used to. Younger children may find this a little frustrating. Moving a single image in such a small space can often move other images, thankfully, the developer has created a layers menu at the top (multiple page icon) that enables you to lock the layers and place them in order. 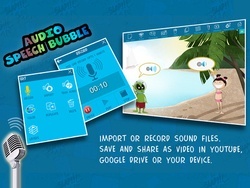 The Text Bubble icon – Here you can choose from a range of different text bubbles to suit you comic style. The text in the bubble can be edited when you double tap on the text bubble - Above the keyboard, in a horizontal white band, the text that you are typing in the bubble appears. You can edit in between sentences by holding your finger anywhere on this space and will see the magnifying glass appearing, using which you can drag the cursor the desired word to be edited. The only thing is that we cannot directly edit the sentence inside the text bubble but can still do it on the text space above the keyboard. The Camera icon – this gives you direct access to your devices camera. Once a picture has been taken it can be cropped like all other images. The crop tool offers free form cropping and also shapes which can be used to cut out the desired areas. There is an option to delete the whole background if you double tap on the background, you will find the delete option in the editing box. You can also go to the 'layers' at the top of the menu and delete the whole background layer from there. The Paint Pot icon – this gives you access to a basic drawing package. We felt this was a good tool for younger children who could draw their own characters and create basic storyboards. Page Sorter icon – this enables to user to sort multiple comic pages in order. Slideshow icon – the ability to show your comic as a slideshow would be a great for the classroom. Save and Link icon – This enables the user to save the comic in a variety of ways. The comic can be saved as an image, a template and Google Drive. It can be exported to iBooks, Nearpod and word documents. You can share via social media using twitter, Facebook, however, the Instagram option has been removed. It also can be emailed and printed in this menu. Customise your own text styles by applying a drop cap, adding a shadow, outline or colour. The ability to colour the text with varying stroke colour and thickness is a really nice added feature. This new feature also includes text pacing, adding two colours to create a gradient fill. You can now edit the length, size and direction of your speech bubble tail. This is great for extending bubble tails to characters that are positioned in a tight space on the page. Not only can the tail of the bubble be extended but also the arc. You can also add shadows to text, speech bubbles and images. The drop shadow can be edited by colour, distance from the subject and the position according to the shadow wheel. 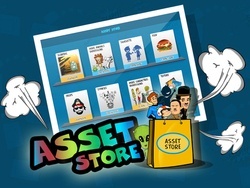 Once again the asset store has been updated with new assets so you can make even better comics that cover a wide range of subjects. One of the new features that we love on the 3.1 version is the introduction of Art Pool which is an Art sharing platform where common individuals can add and integrate their comics. This ideal for a classroom set up where I class may be collaborating on a single theme or storyboard. They can also share their art to Comics Head and its users and see their work featured in the App. We are very impressed by this app and it is great value for money considering the amount of features it has. It is clear that the developers have listened to their users and enhanced the app by adding these great new functions. This app could be used across all subjects but is probably best suited for 11+. The story telling with Comics Head is endless and it deserves our 5-star rating. It is great to see that the developers are continuously listening to consumer feedback and adding exciting new features with every update. We all love to tell stories, share our experiences, comment on issues that affect us and tell our friends about places we visited. 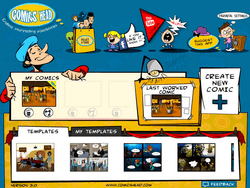 Comics Head enables you to do all of it in a visually compelling format - comics and photo journals. You needn't be an artist! The App is an easy to use self publishing tool and can be used to create storyboards, comic strip, even business presentation or art! If you have an idea you can instantly create visually interesting content on the go. Get started quickly by choosing from our many templates and inbuilt art assets. Go viral with your ideas by sharing on facebook and email. It is a quick and easy way to make your own memes! 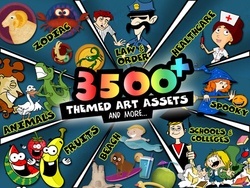 Loads of art assets with Characters, Emotions, Backgrounds & Props and 1000+ Themed art assets as well. Comics Head has a collection of inbuilt templates, where, you can edit/modify the existing ones, or create your own comic. Capture your favorite moments using camera and create your own comic or photo journal. Capture screenshots of maps or websites without closing the application and use them in your presentations. Edit your content by adding more designs using the Paint option or crop them using the Crop tools like Regular, Irregular crops or using shape tools. Manage your contents by bringing the objects front or sending them to the background. You can also flip or rotate them as required. Choose your fonts from the inbuilt list of fonts. Share your creative contents on the go, through Facebook, Twitter, or send them over e-mail. Easily print your creations using AirPrint. There will also be periodic updates of new art assets! !